There are a lot of old-style ATMs. The newer ones have multicolored displays (aside from the standard blue screen), video commercials, voice greetings and touch screen interfaces (which I have yet to encounter). Exterior wise, they look the same... Some look a mechanical scale where you step on a platform. Some look like a high-rise urinal with buttons. Some look like telephone booths that shoots out bills instead of inserting coins. Others look boring. 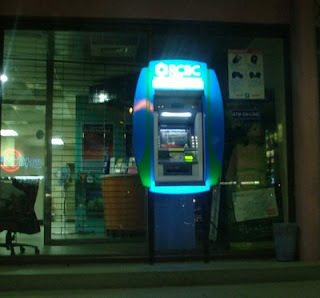 That's why this particular RCBC ATM caught my attention. It has flashy neon lights. and from afar, it looks like a huge celphone.